The Pentagon has declared “China possesses the most rapidly maturing space program in the world.” Yet, the nature of recent developments has experts questioning what the Chinese regime’s true intentions are in space. Among the key issues are the Chinese regime’s experiments with space weapons. It has tested several of these, and has consistently told the public that it was testing something else. The United States is concerned that the Chinese regime’s “continued development of destructive space technologies” is a “threat to all peaceful space-faring nations,” states the Pentagon’s 2015 annual report to Congress on the Chinese regime’s military and security developments. Such programs are of particular concern for the United States. A significant part of modern military power relies on satellites—from GPS and communications, to early warning systems. The most notorious of these tests was in January 2007 when the Chinese regime launched a rocket and destroyed one of its own satellites. Today, however, its space weapons have gone far beyond rockets to include directed-energy weapons and satellite jammers. 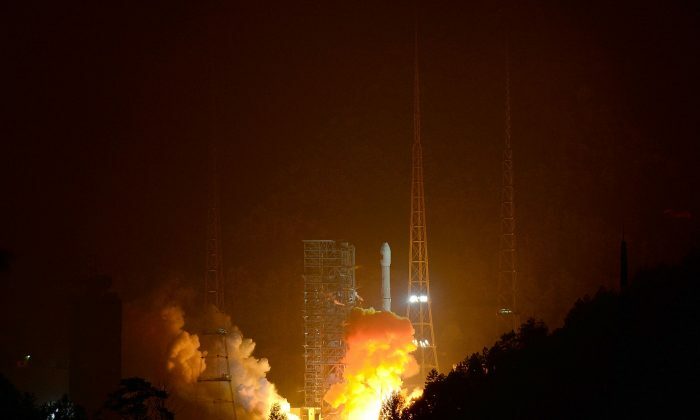 While defense experts have warned for years about the Chinese regime’s development of space weapons, the issue is only now reaching the mainstream. Air Force Space Command recently broke its silence on an episode of “60 Minutes,” which aired on April 26. Adding to the already rare event, it featured top-level U.S. military officers warning of China’s anti-satellite weapons and declaring that the Chinese regime is a military threat. The development was more significant than it appeared, according to William Triplett, former chief counsel to the Senate Foreign Relations Committee and an expert on national security, who spoke with Epoch Times in a previous interview. Meanwhile, just weeks prior to the “60 Minutes” piece, on April 14, the same officers including Air Force Lt. Gen. Jay Raymond, warned of the Chinese regime’s space warfare programs during a segment that required security clearance to attend at the Space Symposium in Colorado Springs. “Soon every satellite in every orbit will be able to be held at risk,” Raymond told the website Breaking Defense. One of the key reasons why the Chinese regime’s anti-satellite programs have U.S. officials concerned is that the programs appear to be targeted at the United States. In the case of anti-satellite weapons, they would hypothetically allow the Chinese regime to disable the high-tech U.S. weapons system that its military could not otherwise defeat, which would in turn even the playing field. An otherwise silent branch of the U.S. military has suddenly decided to speak out.